Squad up and be ready to hit the streets of Southern San Andreas with everything you've got. It's Combat Week in GTA Online, featuring big discounts on heavy artillery and military vehicles from Warstock. The fine people at Merryweather & Ammu-nation are also contributing to the carnage with sales on select goods & all services. Should you be a little light on cash or RP, there's Double GTA$ & RP available for playing In and Out (including 3 brand new maps) and Double RP on plenty more modes besides. Read on for full details. Whether your vehicle collection is missing a HVY Insurgent (Armed), Mammoth Hydra or the humble Zirconium Journey - now's the time to put the jewel in your garage's crown with 25% discounts on all Warstock vehicles. This includes the Turreted Limo, Buckingham Valkyrie and, of course, the Rhino - perfect for protecting yourself and your loved ones during Combat Week. Order these brutish vehicles from the Warstock Cache & Carry website, accessible via your in-game iFruit. Found yourself in a tight spot? 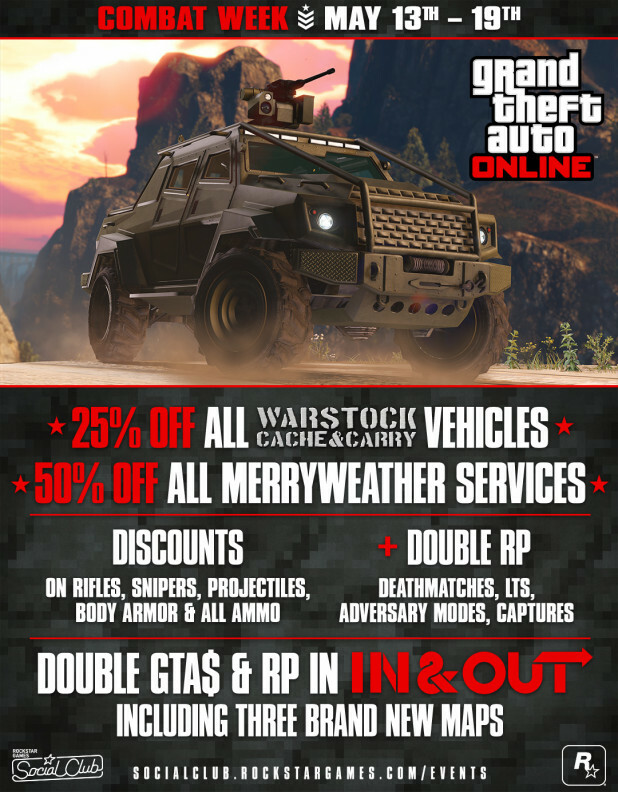 Call on Merryweather for a few reinforcements, some emergency Ammo or a quick escape vehicle this week with prices for all of their services slashed by half. This includes Pickups via sea and air, Backup from a Helicopter or Mercenaries and targeted Ammo Drops and Airstrikes. For those enjoying the challenge of deftly wresting contraband away from trigger-ready Defenders, or from the daring runs required to retrieve them as Attackers, you can earn Double GTA$ & RP while playing In and Out all this week. This includes the three brand new maps and applies to the mode no matter where you're playing it - whether in your own Playlist, the Rockstar Created Playlist launchable from the GTAV boot screens till Sunday, or simply as a one-off invite from a friend or foe. In addition to the bonuses available in In & Out, there's also Double RP to be gained across ALL Deathmatches, Last Team Standing, Captures and Adversary Modes in GTA Online. Whatever form of combat you prefer getting stuck into, play it safe in the knowledge you'll be raising your rank on the double. To quickly dive right into gameplay and reap immediate GTA$ and/or RP bonuses, load up the daily Playlists from the GTAV boot screens featuring a variety of Adversary Modes. The number of maps on which to play In and Out doubles in GTA Online, taking the Capture-style team play into brand new territory at the Grand Senora Desert, Los Santos International Airport and at Dignity Village. As mentioned above, all In and Out maps will earn you Double GTA$ and RP this week, no matter how or where you play them. GTA Online Combat Week - Your avatar looks thin. 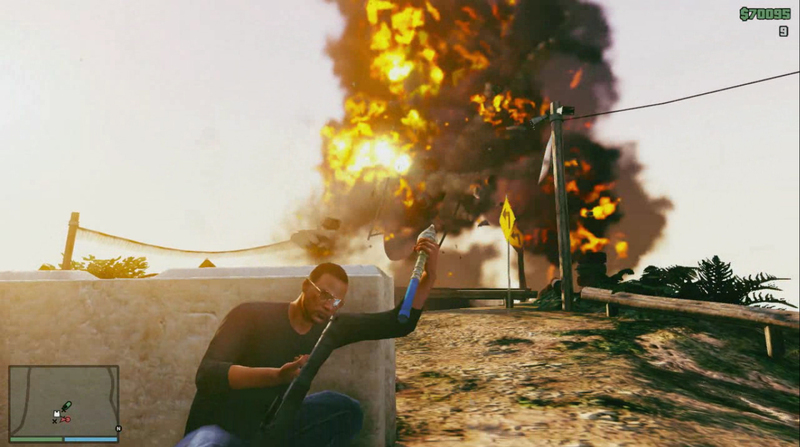 Have some more GTA$ and RP along with discounts on military-themed items. There are also three new In and Out Adversary Mode maps.